So, today, let's begin “Zazen for Beginners.” Because we’re always beginners. In a series of talks over the coming days, I will discuss this and that about “Just Sitting,” which has much to do with dropping thoughts of “this” and “that" and all the other clutter that tangles our heads. We’ll talk about where you can expect to “go” in your practice, and what you can expect to attain, which has a lot to do with dropping the constant hunger to "get" and "attain." Don’t think, however, that not thinking of “attaining” means that something special is not attained thereby. And freeing our self of all need to get somewhere can be truly the key to finally getting somewhere! (Zen folks tend to say seemingly crazy and contradictory stuff like that sometimes. It is what all those wild Koans are about). 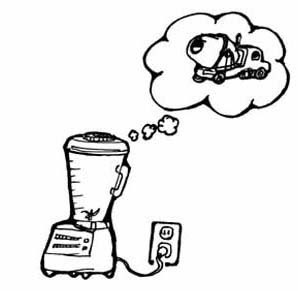 Let’s start by seeing the mind as like a noisy kitchen blender ... filled with all kinds of rattlin’ stuff. Last edited by Jundo; 11-08-2016 at 12:58 AM.